Join the National AIDS week Business Bannerthon Challenge and become a partner contributing to make a difference to the impact of AIDS on our country and businesses. The AIDS week business Bannerthon idea has appealed to the concerned yet competitive spirit of South African businesses. thus evoking their need to be involved in a meaningful challenge to address the real threat that AIDS is to our businesses and our country. 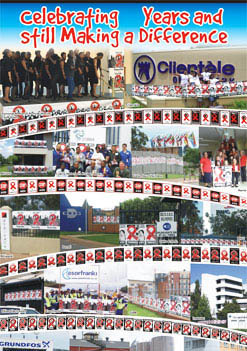 The launch of the first AIDS week Bannerthon took place in 2001. The concept was developed to get the business community to visibly show their solidarity and support in the war against AIDS whilst simultaneously raising money for AIDS orphans. Create visibility and awareness of the Annual International AIDS Week by companies surrounding their grounds with at least 100 meters of 800mm wide Banner Roll printed with the latest "Aids Day Slogan" and new design. Encourage participants in a "Bannerthon Challenge" to also participate. Make a meaningful monetary contribution to the innocent victims of this pandemic - namely AIDS orphans. The goal being to raise funds by contributing 15% of Banner Roll sales to selected AIDS orphanage homes. The success of this worthwhile and unique challenge is dependant on the South African Business community rising to the challenge and being part of the effort to help raise a Million Rand which will be split amongst several organisations nationally that care for HIV / AIDS orphans. These organisations have been chosen to represent a fair spread across all provinces. Only 1000 companies purchasing an average of 100 meters at R4350.00 (excl VAT & delivery) will raise a million Rand for AIDS orphans. Hint: You can also purchase more than you need and donate it to your local school, church or institution. To make your pledge to help raise over a Million Rand and place your order for Banner Roll phone (011) 452-1101 and you will be invoiced immediately and requested to make a direct deposit into the Bannerthon account or send a cheque with your official order (account details supplied with your invoice) to the Bannerthon Organisers. In addition to receiving the Banner Roll, which will be put up (as per the examples of last year) participating companies will also receive a Certificate acknowledging their participation. This can be proudly hung in their reception areas as a reminder to staff and the public of their company's commitment to fighting the AIDS pandemic. Gold - All purchases over 500 meters. Silver - All purchases over 300 meters. Bronze - All purchases over 100 meters. The AIDS banners are to be displayed from the beginning of AIDS week (first week in December) until Christmas break. We need to secure orders and payments early to practically print, deliver and process orders to achieve our goal of getting over 1000 companies to participate in the Bannerthon Challenge. To raise a million Rand for AIDS orphan homes. Show business's visible concern and support of AIDS week / day to their staff and public. 300 km and thereby create the unity and camaraderie needed to fight this pandemic.